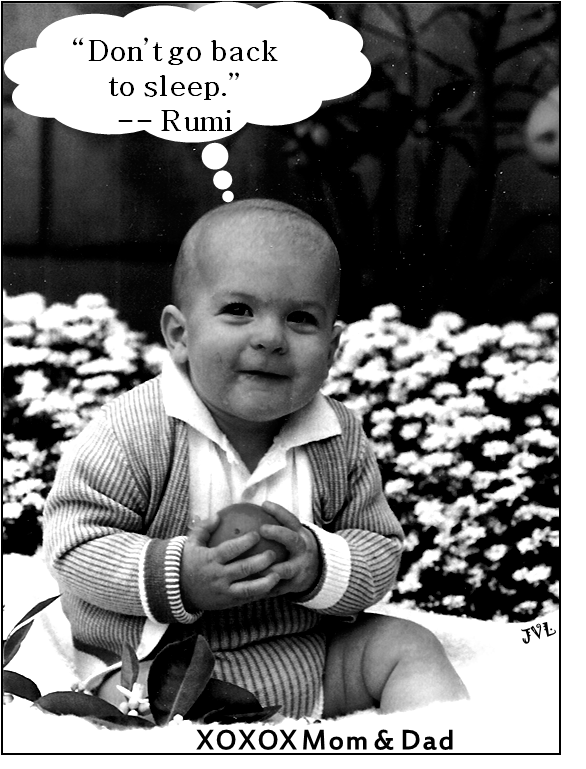 Our son Jack started reading Rumi’s poetry in high school, so Tim and I placed this “ad” in his graduation yearbook back in 2003. That’s Jack sitting on a blanket holding an orange and looking, I think, very Churchillian. (He was probably 6 months old and the flower hedge was in fact about 8″ high.) Clearly a deep thinker, he was either contemplating Rumi-esque ideas or wondering how to fit the orange in his mouth. In 2007, Rumi was named the most popular poet in America. He was born in 1207 in Afghanistan and in the intervening 800 years was consistently among the best loved Persian poets. More recent translations into English that captured the essence of his poetry, where literal translations had failed, brought his popularity stateside. Perhaps it’s the shape and texture, color, taste and smell of an orange that the breeze shares with the wakeful child. Or perhaps it’s the the essence of the orange: its gift-ness — all that goodness (still to be discovered!) plucked for him from the backyard’s dwarf orange tree. I’ve found that dawn after dawn that breeze gently blows gifts of comfort, strength, peace and joy for each of us to grasp as tangibly as that orange. And to share with one another as easily as we do an orange, when — awake — we realize that there’s more comfort, strength, peace and joy on each dawn’s breeze. It’s the nature of the the day. * And the nature of the child — dawn after dawn. *”Day. The irradiance of Life; light, the spiritual idea of Truth and Love… The objects of time and sense disappear in the illumination of spiritual understanding, and Mind measures time according to the good that is unfolded. This unfolding is God’s day, and “there shall be no night there.” Mary Baker Eddy, Science and Health with Key to the Scriptures, page 584. In “Victory,” poet Rosemary Cobham writes about blackbirds singing even on the battlefield. “They wait not on the dawn, They sing it on.” Rumi’s “The Breeze at Dawn” may well have been sung and not simply recited. Music and dance played an important part in his Muslim ministry. I think even in the darkest of circumstances, there’s a song of victory on that breeze at dawn. Let’s not go back to sleep. Let’s sing it on. Sing even on a battlefield. God made man perfect, and maintains him so. 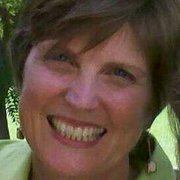 Mary Langworthy is the Director of Christian Science Nursing at Peace Haven in St. Louis, Missouri. Note: the views expressed on this site do not necessarily reflect those of Peace Haven. These are my thoughts!